The Cat Paw Bangle was designed by and is made exclusively for Triple T Studios. The bracelet is so cute, the photos don’t do the bangle justice. This cat inspired bracelet is 925 sterling silver and is subtle enough to wear everyday and does not scream “Crazy Cat Lady” but shows you have feline finesse. 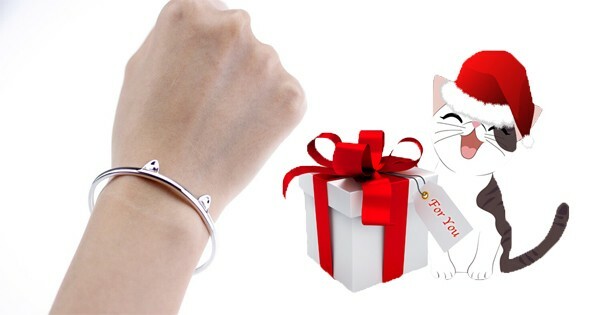 The Cat Paw Bangle features two cat ears at the top of the front of the bracelet. The paws wrap around your wrist giving you a hug reminding you of your love of cats. 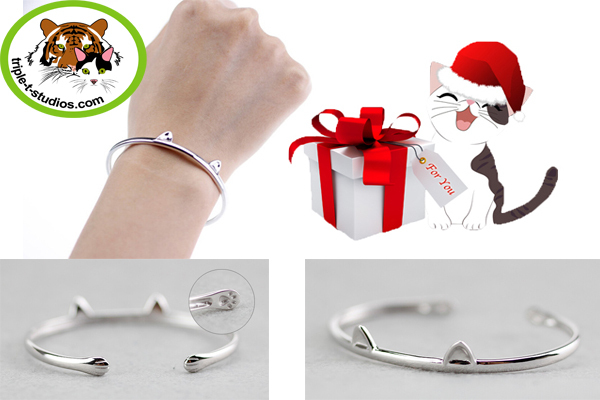 The outside of the ends of the bangle have a cat paw design and the inside has a paw pad and toe design sure to melt your heart. We fell in love with this bangle design and thought you might like it too! Your Cat Paw Bangle will arrive in a gift box ready to give just in time for the holidays but you might want to keep it for yourself. The Sterling Silver Cat Paw Bangle is adjustable so one size will fit most. The bangle measures 2.5 inches from side to side and is slightly adjustable. You can gently squeeze the bangle to fit your wrist. This contest is open to everyone, everywhere! Enter your information in the contest widget so we know where to ship your prize if you win. Leave a comment below this post telling us: Do you like the ears, paws or toes the best? I like the ears ? I love the ears, so cute!! I like the paws best! Congratulations Richard! You are the winner of the Cat Paw Bangle! Your bracelet will be shipped today via USPS. You will receive an email confirmation. Thank you for being a part of The Tiniest Tiger community. Than you. Looking forward to it! I have the ring…I would love the have the bangle to match!! I love the tiny toes! The ears! But the paws are adorable too! The paws are my favourite. I think the paws are super cute. OH my gosh! The little paw pads are just darling! My cat and I love her ears, nothing like stroking these cool silky ear tips and my cat likes that I do it too! The paws are the best part! I play with all my cats’ paws all the time! I’m a nose girl, all the way, then paws, then ears. My world revolves around obtaining as much nose sugar as I can get willingly, and having no shame, I’ll steal it on occasion too. The paws are my favorite. Thanks! I love the paws for sure!! LOL wrote a long comment and then got tangled in another post and lost it. Suffice to say I love ears , paws, toes and everything in-between. Hug Annie for me cause I’m thinking of Gracey and my Skiddy. Thank you for all you do! I like the paws best – they are so cute! I know my daughter would love the whole thing. I love the ears 🙂 !! The paws are very cute! The ears are really cute. I like the ears the best. The cat ears are so adorable! I really love the paws the best. I love everything about this bracelet. But those little toes really make me smile. LOL! Oh, I definitely like those little toes the best!! SO CUTE! Thanks for the giveaway opportunity! 🙂 Happy Holidays! Wow I would love to have these paws wrap around my wrist! The paws are really cute! I have never thought about it because every part of a cat is adorable, but I guess I’d have to say I find the ears the most adorable. I love to play with my cats ears. All of the above, but my big boy Fuzz loves an ear rub! I love pink jelly bean toes on the paws! i have been eyeing this bracelet for awhile. love it!